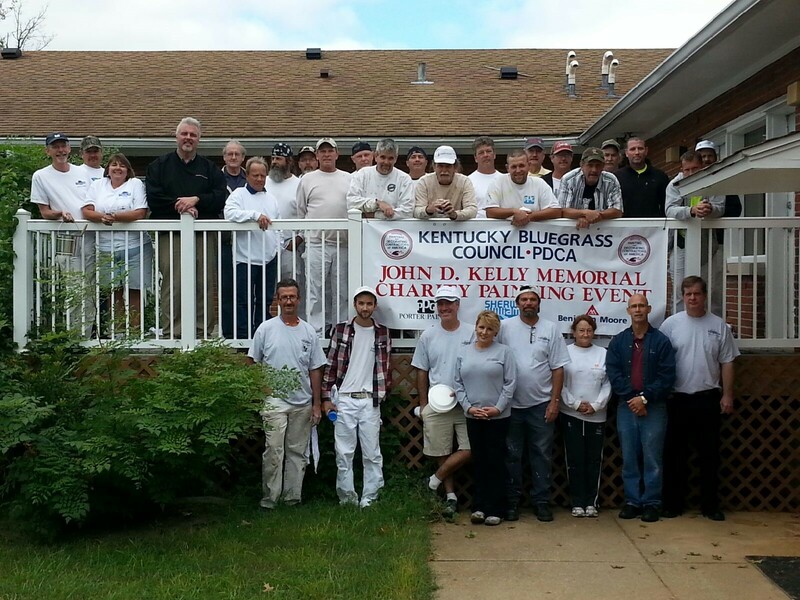 The Kentucky Bluegrass Council of the Painting and Decorating Contractors of America (PDCA) coordinated a painting party valued at upwards of $35,000 on September 13th during the John D. Kelly Memorial Charity Painting Event. The event took place at the campus of this year’s beneficiary, Boys & Girls Haven (2301 Goldsmith Lane) in Louisville. Boys & Girls Haven provides a home and a future for abused and neglected children in Kentucky. Kentucky Bluegrass Council PDCA members provided approximately 200 hours of professional painting labor. Paint and materials were donated by event sponsors, Porter Paints and Sherwin Williams. About 40 painters arrived at 7am and were treated to breakfast donated by White Castle. By noon, the professional painters had painted interior and exterior portions of Boys & Girls Haven’s residential cottages and its on-site JCPS school. “Boys & Girls Haven depends on the generous hearts and skillful hands of volunteer groups like PDCA Kentucky Bluegrass Council. This fresh coat of paint will bring smiles to staff and kids alike. We can’t thank them enough,” said Josh Swetnam, Director of Programs & Operations at Boys & Girls Haven. “We are proud to have a membership of contractors who are so willing to come out on a Saturday and give to Boys & Girls Haven. Giving back to our community is something we will always keep doing,” said Robert Plawinski, President of Kentucky Bluegrass Council PDCA. The Kentucky Bluegrass Council of PDCA coordinates its annual charity painting event to benefit a local children’s charity of its choice. This year’s event was held in memory of John D. Kelly, who served as the Executive Director of the PDCA Kentucky Bluegrass Council for more than 30 years. Mr. Kelly passed away unexpectedly in March. This is the second time that Boys & Girls Haven has been the beneficiary of the Kentucky Bluegrass Council PDCA’s annual charity project. Boys & Girls Haven exists to shelter, heal and teach struggling young people to become productive and healthy members of our community. Since 1950, Boys & Girls Haven has transformed the lives of more than 5,000 abandoned, abused and neglected children. More than just a home, we provide stability, education, and new, productive skills that will lead to success in adulthood. In a time where more and more children find themselves growing up without the support of a loving family, Boys & Girls Haven is here to provide a home and a future filled with promise.